So your bike’s been stolen. I know, I know. But resist the urge to put your fist through a wall or collapse in tearful heap. Instead, pull yourself together and get on with the following 9 steps. They can help you get your bike back. Even if they don’t, at least you’ll know you did everything you could! And if you need to buy a new bike, they’ll make that a bit easier too. Get the word out on Facebook, Twitter, Instagram, Tinder, Grindr, whatever! Put all your bike’s details on your social media feeds, include where and when your bike was stolen and ask people to share. There’s actually loads of websites and social media profiles that have been specifically set up to help you here. Let them know your bike’s been stolen and they’ll send out tweets to their followers who will keep their eyes peeled for your bike. So what are these sites? In the UK there’s Stolen Bike Alert, Stolen Bikes UK, Stolen Ride London and probably several more local to you. Google is your friend here. Search for “stolen bike alert [where you live]”. There’s not so many in the US, but BikeWatchNYC is trying to a similar things in New York. Let me know if you’ve got any other good ones and I’ll add them here. If you’ve already registered your bike with the various online organisations that keep track of bicycles (such as Bike Index, the National Bike Registry and the National Cycle Database), now’s the time to log in and tell them that your bike’s been stolen. They may have Twitter feeds and Facebook pages that will publicize the theft. But more importantly, their databases will be updated so that if the police recover the bike, or anyone is offered the bike (and they check the serial number), they’ll see that it’s your stolen bike. If you haven’t already registered with one of these organisations, it’s not too late. You can still add the details after a theft. 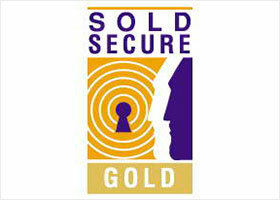 Simply create an account and add the make, model, serial number and any other information you have. You do know your serial number don’t you? If not and you’ve still got a bike, go and find it now. It will only take 5 minutes and will save you a load of problems and possibly a lot of money later on. File a police report as soon as possible. This is really important. You might not have insurance. You might think the police will do nothing. You might think it’s a waste of time. But the fact is that almost half of stolen bikes are eventually recovered by the police. And the only reason that only 5% of stolen bikes are returned to their owners is that the police can’t link the bikes to the owners. But if they recover a stolen bike and you’ve filed a report with a serial number, they’ll link it to you and you’ll get your bike back! It will also give the police a more accurate picture of the extent of bike theft where you live so that hopefully they’ll be able to allocate more resources to it. So collect all the information you have on your bike. Hopefully that includes the make, model and serial number, some photographs and a detailed description. And either give your local police station a call or go down there in person. You must do this as soon as your bike’s been stolen. Your insurance policy probably stipulates that you file a police report within 24 hours. And certainly both Kryptonite and OnGuard’s “anti-theft protection” require you to report the theft to the police within 72 hours. You’ll need to give them some personal details, which will typically include your name, gender, date of birth, some contact information and a mailing address. And you’ll also tell them everything you know about the circumstances of the theft, including where, when, how and anything else that might be useful. For example, are there any CCTV cameras in the area that might show the theft? In exchange they’ll give you a police report which is of course vital if you have insurance or you registered with one of the “anti-theft protection” programs from Kryptonite or OnGuard. Hopefully you’ve got some sort of insurance policy. Either you’re covered by your household insurance. Or you have specialized bicycle insurance. Get in touch with them by phone as soon as you have the police report. They’ll require the same information you gave the police plus the crime reference number from the police report and your receipts of purchase. Again, do this as soon as your bikes been stolen. Most insurance companies will stipulate that you need to at least alert them of the theft within a certain amount of time. And of course the sooner you file a report, the sooner you’ll have a new bike! 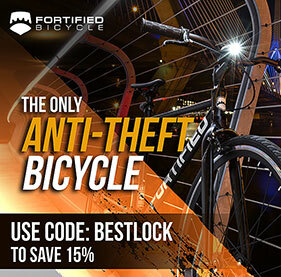 If you’re registered with either the Kryptonite or OnGuard “anti-theft protection” scheme and your bike was secured with their lock when it was stolen, then you should make a claim. Make sure you do so within seven days of the theft and include all the necessary information. I go through everything you need to do here. Check out the listings on ebay, Gumtree and craigslist. 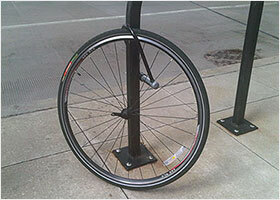 Thieves will often try to sell stolen bikes through these sites. But a bike probably won’t be listed as soon as it’s stolen. So the easiest way to keep an eye on the adverts is to set up alerts. With all three sites you’ll need to register so that they can send you emails (don’t worry, it’s free). Then search for the make and model of your bike and save the search criteria so that any new listings are sent to you via email. How do you save your search? With ebay just look for the “follow this search” option at the top of the search results. On Gumtree there’s a pretty obvious “Set search alert” button. And on craigslist it’s a “save search” link. And from then on, you should get an email everyday with any new listings that match the make and model of your bike within the geographical area that you specified in your search! So what do you do if your bike comes up in a listing? You definitely shouldn’t accuse the seller via email or phone. You could be wrong. And if you’re right, they’ll simply get rid of the bike before you can do anything else. You definitely shouldn’t go and buy your bike back from them either! Bizarre as it sounds, I’ve heard of people doing just that. But it obviously stinks of defeat and will only encourage further thievery. You should probably avoid going down there to reclaim your bike yourself too. Any sort of confrontation could easily escalate into something very nasty. No, the sensible thing to do is contact the police. They will advise you of the best course of action. And hopefully they’ll even come down and sort the situation out themselves! 6. Check the flea markets and pawn shops! 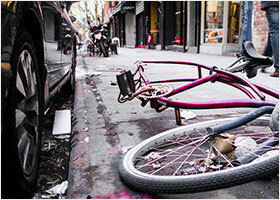 Many towns and cities have informal areas where stolen bikes are traded. You probably already know where they are in your neighborhood. If you don’t, ask around. In London for example, Brick Lane market is notorious as the place to go to buy or sell stolen bikes. I’m not sure what it’s like these days but it used to be a very blatant thieves bazaar. Again, if you spot your bike it’s best to contact the police rather than try to sort the situation out yourself. Pass all the information you’ve got on your bike to your local bike shops. It makes it so much easier for them to spot something suspicious if they’ve already got their eyes peeled for a bike like yours. Maybe this is a last resort. But putting up posters in your local area will reach a whole load of people that the other steps won’t. Maybe someone’s seen or heard something. It’s worth a shot! 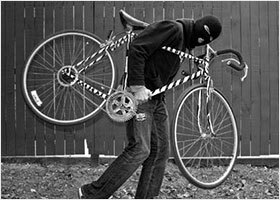 One of the most depressing statistics that I’ve come across regarding bike theft is that of the 50% of us that have bikes stolen, 66% cycle less and 25% give up cycling altogether! Don’t be one of those statistics. If all else fails and your bike isn’t recovered, it’s time to get a new one! You have to keep riding. I know that it’s gut wrenchingly upsetting when your bike is stolen, but we can’t let the thieves win. Get a new bike. Get a better lock. Make sure you know how to lock your bike properly. Don’t let it happen again. 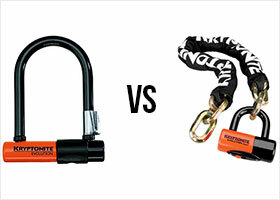 Bicycle security is all about finding the right balance of security and convenience. So readjust the balance. Now obviously this is going to cost money. But if your bike was so expensive that you can’t replace it easily with the money in your bank account, then you’ve probably got insurance, right? I know that when I’ve had bikes stolen in the past and I’ve been short on cash, I’ve been tempted to buy a stolen bike myself. Obviously it’s a easy way to get back on a bike for a cheap price. Resist this temptation! It goes without saying that you’re only perpetuating the whole sorry mess. 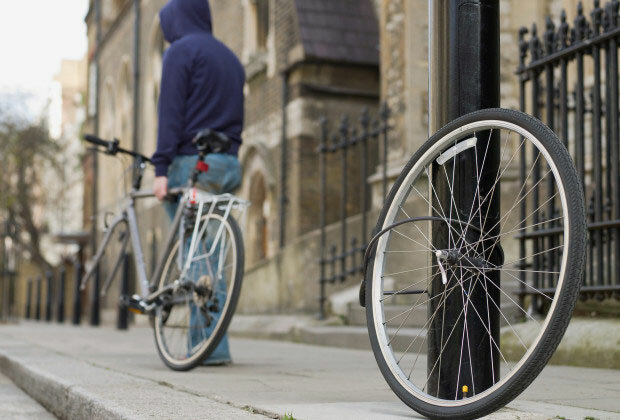 If everyone stopped buying stolen bikes then bike theft would virtually disappear overnight. Instead, if your buying a second hand bike, be extra vigilant. Insist on seeing receipts. Check the serial number using Bike Index, Bike Register or Check that Bike. But it’s usually pretty obvious when someones selling a stolen bike. If it’s unusually cheap. If he won’t meet you at home. If he’s double shifty. You know it’s stolen. Don’t buy it! I’ll end on a heart warming note here. State Bicycles have a stolen bike policy that will give you $100 (or equivalent) off one of their bikes if you send them a police report filed in the last 90 days. You can buy online and there are stores that sell their bikes all over the world. I think that’s a pretty nice offer. It would be great to see other businesses doing similar things! Having your bike stolen is a proper bummer. And unfortunately it will probably happen to most of us over the course of our cycling lifetime. The best thing we can can do is to prepare for the eventuality. And then when it happens, do everything we can to improve the chances of recovering our bikes. The worst thing we can do is to stop riding. My bike was stolen this week. It was a yellow ladies Nishiki. I’ve had it for 35 years here in Brooklyn. I do not own a car. This is how I get around. I am quite sad about the whole thing. I loved that bike, and I think it loved me. It had a seated smiling Buddha sticker on the seat stem. If you see it. … it’s mine. I’m really sorry to hear that Lisa. 35 years is A LONG time to have one bike! Hi, mine was just stolen too. I built it up piece by piece. But I moved on found a decent deal on eBay and I might even live the new bike more. Hoping you find the same! Hello my name is Clev, I work at the Wholefoods In Chealsea New York City, my bike was stolen it was locked up right across the street from me. I came back from my lunch break only to find it gone. I did file a police report. I was wondering where can I go to find a replacement bike to purchase or even a used one? I’m really sorry to hear that Steven. Don’t give up yet though. With the information on this site, you can find a way to beat the thieves! Had my carbon salsa bear grease stolen from my apt in eauclaire. Karma kills. Just a note compensation wise, I had my bike stolen while I was saying hi to a friend and you might be able to get a replacement through like insurance or even your credit card company. Check your account if they do buyer protection because if you paid for your bike with a credit card like I did, they may refund you the cost of the bike (mine does return/replacement of things bought with the card). They don’t do vehicles but they will do bikes, so try looking into that as well. My bike was stolen in front of my home. It was locked to the iron gate no more than two hours in daylight and there are evident saw cuts in the iron that idicate power saw usage. The lock was a nyc kryptonite lock. I have the bike fixed with pinheads so it will be difficult for them to disassemble it save a proper suzed drill to get them out. Totally gutted. Love that bike and worse it is from in front of my home. Filed a police report, have/gave serial number. Not much else I can do except wonder if it is the neighbors or someone on the street. Thanks, Carl. No I couldn’t, just sad that there are meanies like that out there… Boo on them! Trying to keep positive! Make sure you regsiter the bike with Bike Index. You can do this even though it’s already been stolen. Then, if it turns up anywhere, the police will be able to find you through Bike Index. Plus prospective buyers will be able to check the Bike Index database to see if the bike they’ve just been offered is stolen. A desperate soul stole my blue Walmart bike from Parkview Ave. In Pittsburgh. I paid $100 for that bike (Avalon) and put so many happy miles on it. Obviously it was not worth much, and it was a 7-gear bike that had the brakes hang up a bit. it was not fancy but it did the job of getting me around for fresh air and exercise. RIP royal blue Walmart bike . Yep I feel your pain Diane. As I’ve talked about before we can can very attached even to a crappy beater bike! I had a $500 PRIORITY BIKE stolen today from my work in LOS ANGELES CALIFORNIA. It is GLOSS BLUE with BROWN Handel bars and it says PRIORTY BICYCLE on it in black and a belt drive. This was my only way of transportation. I’ve had this bike for almost five years and it’s myself and it’s like my baby we go everywhere on it. If anyone lives in CALIFORNIA and sees it and not notify me i would a appreciate it.